Ken Pisi was speaking at a Gallagher ‘Train with your Heroes’ session at Northampton Outlaws after the club won a nationwide competition launched by Gallagher. 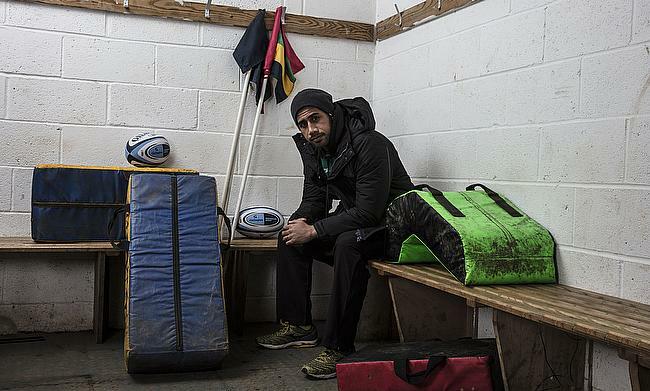 This is Ken Pisi’s seventh campaign with the Northampton Saints and the first season that Pisi has played under someone other than Jim Mallinder. The Samoa international has experienced the heady heights of a Premiership win in 2014, as well as a Challenge Cup victory in the same year, but now Pisi and the Saints are going through a different chapter under Chris Boyd following a tough 2017/18 season. “Last season wasn’t the greatest, but I think now, everyone is getting back onto our side and it’s good” said Pisi. “The loyal fans have always been there for us. There can be some bandwagon fans, like at every other team that’s doing well, but we’ll take their support and we’ll use it. Pisi hasn’t been seen much in a Saints shirt so far this season under the stewardship of Boyd. A shoulder injury in September kept Pisi out until the club’s tie against Leicester Tigers in the semi-final of the Premiership Cup competition at the end of January. Playing for over 70 minutes on his return, Pisi was grateful to be back in action. ?? "The lungs were going, then the legs, then everything else!" With the final months of the season to come as Northampton look to impress in the Gallagher Premiership, European Challenge Cup and in the Premiership Rugby Cup final against Saracens, Pisi is also focused on gaining the recognition of the Samoa national team coaches as he sets his sights on his second Rugby World Cup: “I want to play for Samoa. If I can get a couple of games in, I can hopefully impress some of the coaches for World Cup selection. Northampton will be facing off against a fifth placed Sale Sharks side, just three points ahead of Saints. Losing out by just five points in November, Pisi says that they can only try and better that performance this weekend. Ken Pisi was speaking at a Gallagher ‘Train with your Heroes’ session at Northampton Outlaws after the club won a nationwide competition launched by Gallagher, a passionate community insurance broker and proud title partner of Premiership Rugby.